Did you know that the average price of a wedding dress in the UK is £1385? For those on a budget, these price tags are not realistic. Not all of us can afford to spend a large amount of money on a wedding dress, no matter how special the day is. If you’re planning a budget wedding, opting for a cheaper wedding dress is a great way to try and cut the cost. But, don’t be fooled into thinking that cheaper means lesser quality. In fact, you’d be surprised at the amazing quality you can get at a lower price. There are lots of reasons to find a discounted wedding dress. Cutting an extra few hundred pounds off the dress could mean you can go somewhere more exotic on your honeymoon. Think about what you value most about getting married. You’ll only wear your dress once, but a honeymoon could be two weeks! Before starting your search to find the perfect wedding dress, you must set a budget. It can be hard, but setting a maximum price means you know what you’re looking for. You don’t want to get your heart set on a dress, only to discover that it’s not what you can afford. With a budget in place, it’s time to find your dress! These three simple ideas can help you find an incredible budget dress for your big day. Sample sales are one of the best ways to find a high-quality, designer wedding dress at a discounted price. Dresses used in a sample sale may have been used for marketing or as a sample dress for brides to try on. The amount saved from buying a sample sale dress can truly be huge. Discounts can be up to 70% off the normal price, creating an incredible saving. Be sure to search for some of the best sample sales in your area and book an appointment as soon as possible, as these dresses are likely to go quickly. If you’ve got a hidden seamstress in your family, it’s time to call upon them for a very big favour! Or, perhaps you have a hidden talent with a sewing machine that’s dying to come out. Making your own wedding dress or having somebody you know make it can reduce costs significantly. There are two major benefits to making your own wedding dress. Firstly, you can literally create your perfect gown. From the materials to the style, it’s all up to you, meaning you can create the perfect wedding dress for your figure. Secondly, it’s a great way to save money. Of course, you can choose a more expensive material. But, many different fabrics are excellent value when you buy in bulk. If you or a loved one is capable of putting together a gorgeous dress, it’s a great way to create a unique wedding dress that catches the eye saves you plenty of money. Did you hear recently about the bride who wore her grandmother's wedding dress? The dress was originally worn in 1962, but the new bride wore it as a surprise to her grandma. Sure, using a dress previously worn by a family member is an amazing way to save money, but it also adds even more love and togetherness to the occasion. If needed, alterations can easily be made to make sure that it’s a perfect fit. 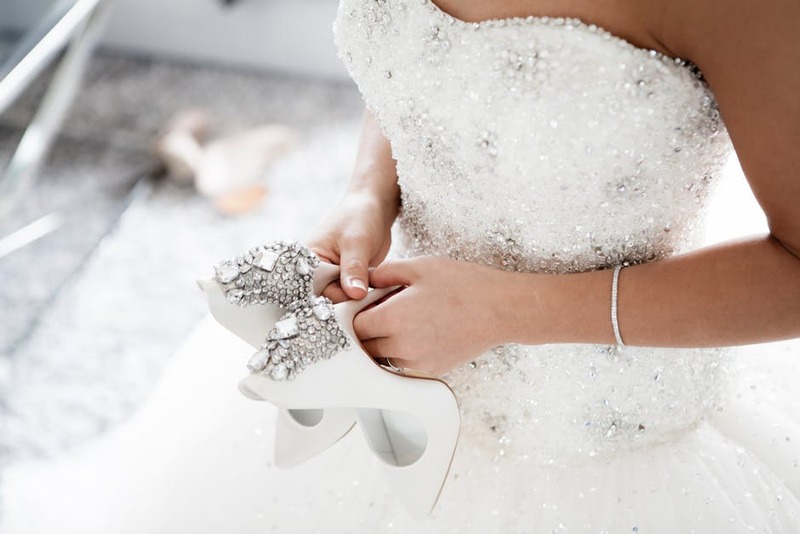 Accessories can also help to make the dress more modern and unique to each bride.